Following unsuccessful campaigns in 2002 and 2007, the 2011 election will be Sinn Féin candidate Jonathan O'Brien's third attempt to secure a Dáil seat. 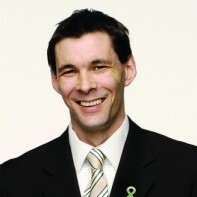 O'Brien has been a member of Cork County Council since he was co-opted in 2000 and is currently the leader of the Sinn Féin group. In recent years, the Farrenree politician has been a particularly active on anti-social issues. O'Brien is one of the founding members of the Coalition of Communities Against Drugs (COCAD). First off Congrats on winning. Secondly, I am aware of your success in the COCAD. I think it’s fantastic that someone has the courage to stand up to these people. Mt question is, Do you think it would be more benficial to the country if we regulated and taxed cannabis, So that the money being made from the drug can be put into areas like health and education instead of going into the pockets of drug dealers that will use that profit to invest in weapons, hard drugs and other things that are a danger to society?